Anyone who’s been to Europe will tell you: “pack light.” It’s advice I agree with on principle, and even as I was packing I was aware that no matter how vehemently I might agree that yes, packing light is the right thing to do, it would never happen. To be fair, when you’ve been invited to Italy with a painter, it’s expected that you’ll carry your weight in canvas. By the time our flat owner met us at the Assisi train station twenty-three hours, 4 trains (2 US, 2 Italy) one 9-hour flight, a 15-minute run alongside a track to the train going to Perugia (which we made with 2 minutes to spare), and a three-hour train ride later, we were ready to collapse. As the flat owner and her husband crammed our bags into the tiny car boot, he muttered “molto pesante” (very heavy), and I responded in my messy bras-italliano, “ela è uma pittore.” (Roughly, “She’s a painter.”) They smiled and laughed, and we made our way up the steep hillside to the walled village of Assisi. The car zipped through the narrow cobblestone streets with mere inches on either side of the car, past crumbling Roman walls, olive groves, and medieval cathedrals, higher and higher, until finally, the car stopped in a piazza. 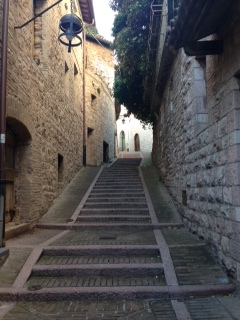 The staircase to the flat, Assisi, Italy. “We stop here,” our host told us. It’s not lost on me that we’re staying a two-minute walk from the very place where legend says that St. Francis threw off all of his clothes and gave up his worldly possessions. I’m feeling similarly inspired – both to travel lighter, and to fully devote myself to this magical place. See more of my photos on Facebook. This entry was posted in Blog on May 4, 2015 by Leigh Hopkins. It was QUITE a haul! MUCH easier going down thaN up, but as I said to Peg, next time I’ll bring half the stuff! Leigh, Here is a story I love to tell of my travels–which included Assisi! I once watched the sun come up in the olive grove of a Monastery in Assisi where in 1205, St. Francis became so quiet and still he could hear God whisper. I have heard the haunting soprano voices of cloistered nuns rising from behind a screen in an ancient church on a hillside in Italy. Singing the sunrise into the day, bringing tears to my eyes for the beauty of it all. I have tiptoed across a dark courtyard at 2AM to spy on Greek Orthodox monks floating in black wool cassocks and high hats through a fragrant fog of amber incense. Chanting Vespers in the candlelit chapel of an Arizona oasis, voices carried to God on white smoke through a starry desert sky. My own soul seeming to rise closer to heaven on every note. And yet, I feel as near to God in those grand moments as I do when I see the tenderness in my daughter’s arm around her big brother; her comforting him, him finding comfort there. Or in the face of my neighbor, who comes to my home to knock on my door, to take my face in her hands (still dirty from her abruptly abandoned gardening) to kiss my forehead and tell me she loves me before turning and heading back home to continue her planting. Or once, when I became completely still and quiet so as not to wake the fevered child lying in my arms, mercifully sleeping, damp ringlets of her dark hair clinging to her flushed cheeks, her breathing calm and deep in the bed I share with her father. In that moment of clear, silent stillness, I too could hear God’s whisper, bringing tears to my eyes for the beauty of it all. I heard those soprano voices, Lori Anne – just hours after reading this comment. You do have a way of experiencing the miraculous in the sublime, the supreme, and the everyday, and I love this about you. Thank you for sharing these gorgeous stories! I knew when I read your 2nd story that I had lead you there. I was sending you such warm memories of my time in that place. Willing you to hear the nuns sing, to stand near the old Roman well in the catacombs under the church, to visit the Olive groves, to take in the view of all of Umbria from the narrow openings in the Caslte walls of Rocca Maggiore. It is a magical connection. Next time, I’ll pack HALF the amount!